When Disney’s Hollywood Studios opened in May of 1989, at the time known as Disney-MGM Studios, it had a loud and flamboyant spokesperson just waiting to jump on any gag he could to make a guest laugh. I am, of course, talking about Roger Rabbit. There was scarcely a corner of that early park where you could not find a suggestion of Roger and his wacky crew. As Roger’s popularity waned, so too did his presence with the Studios. However, that doesn’t mean there aren’t still a few references to the 1988 film, Who Framed Roger Rabbit, scattered about. One of which we are going to examine today. 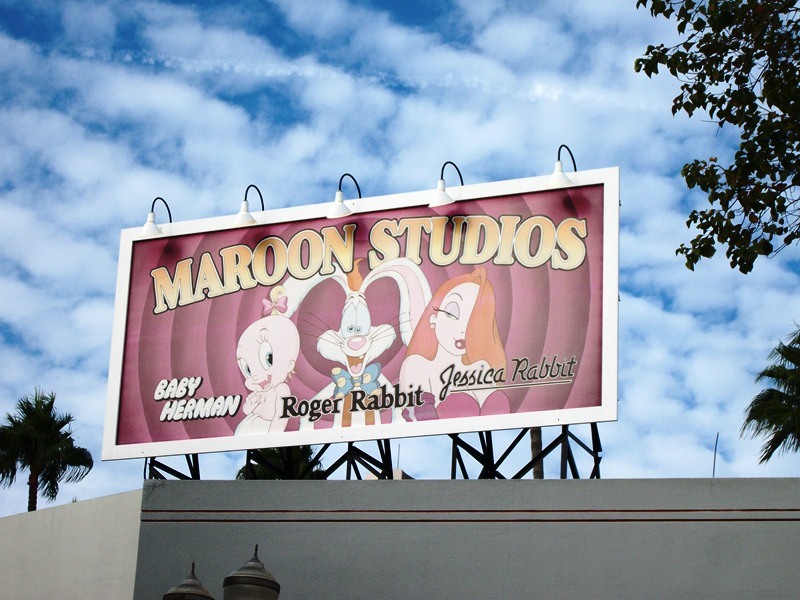 The dead giveaway of this billboard, which can be found overlooking the Echo Lake section of Disney’s Hollywood Studios, is that it has the names and faces of three of the primary cartoon characters from the film, Roger Rabbit, Jessica, and Baby Herman. The real treat is the name Maroon Studios ballooning above the three. Maroon Studios is, according to the feature, the home of the three characters featured on the advertisement. Though we know Roger, Herman, and Jessica all work for Maroon Studios, many of its other characters are left to the imagination of the viewer. Familiar faces from Dumbo and Fantasia appear on the lot, though we are told they are only on loan to Maroon from Disney. The studio, whose full name is R.K. Maroon Studios, is the product of founder and producer R.K. Maroon. It is during the events of Who Framed Roger Rabbit in that R.K. Maroon meets his untimely demise at the end of Judge Doom’s pistol. The role of R.K. Maroon was taken on by Alan Tilvern, in what would become his last feature film performance. When Disney-MGM opened, Disney wanted nothing more than to have Roger standing alongside Mickey as an equal, and presented him regularly in just such a light. For better or worse, Roger’s star never shone quite as brightly as Mickey’s, though that isn’t to say that he doesn’t still have a home within the park!